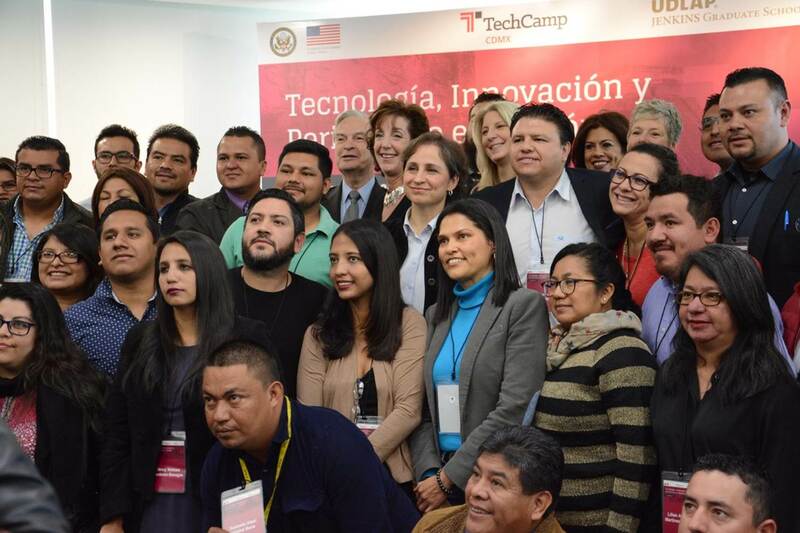 Journalists from Mexico and Central America gathered in Mexico City for the TechCamp 2017 training sessions. MEXICO CITY — This year, five journalists have been killed in Mexico as a result of their work, according to the Committee to Protect Journalists. The U.S. Embassy in Mexico is becoming a more active advocate for freedom of the press. The U.S. Embassy is working on several projects to help local authorities and journalists, and is also calling on the Mexican government to solve the cases of murdered journalists. “This impunity has to stop. There has to be consequences and there has to be justice done in these cases, so it doesn’t keep happening,” said Susan Elbow, head of the Public Diplomacy section for the embassy. She spoke at TechCamp, a program in Mexico City supported by the U.S. government to train journalists from Mexico and Central America. Elbow explained the embassy is providing technical assistance and money to develop the Mexican Government’s mechanism to protect journalists. “An independent media and free press is essential to a healthy democracy, and it is in the United States’ interest to have a healthy democracy as our neighbor,” the diplomat said. And as for those journalists trying to get asylum in the U.S., Elbow says it’s Mexico’s responsibility to look after its citizens. Another nonprofit project under the embassy’s wing is ProVoces. Marianna Gabutti is the coordinator of this initiative financed by US-AID and explained ProVoces will start to operate in January, supporting local organizations. “The project is divided into three axes: one is protection, the other one is prevention and the third one is persecution," Gabutti said. Gabutti says their programs will be implemented on the federal level, although they rely on local organizations and communities to make significant changes. "We are convinced that those who have the best resources to change the security environment for journalists and human rights defenders are on the local basis," Gabutti expressed.